Usually this time of the year Nikolai's school will have a fun day where the children gets to watch The Polar Express dressed in their pajamas with a treat of hot cocoa. My hubby and I have joined them in past years and it's very memorable. 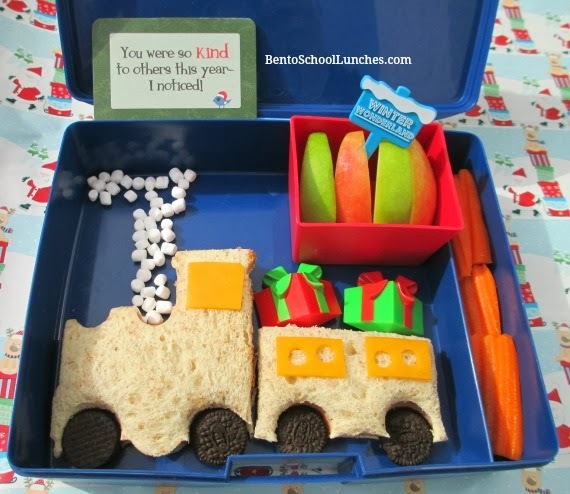 Train sandwich engine is cut from the lunch punch and trailing car is free hand cut with mini Oreo cookies for wheels, Colby cheese accents, and present picks on the top. Marshmallow bits are used for steam. Top right: Red and green apple slices. Far right: Crinkle cut carrots. I included a lunchbox love note from the Holiday edition and this lunch is packed in his Laptop Lunches. What a cute Polar Express bento!! I love how you made the Polar Express! Such a lovely bento!